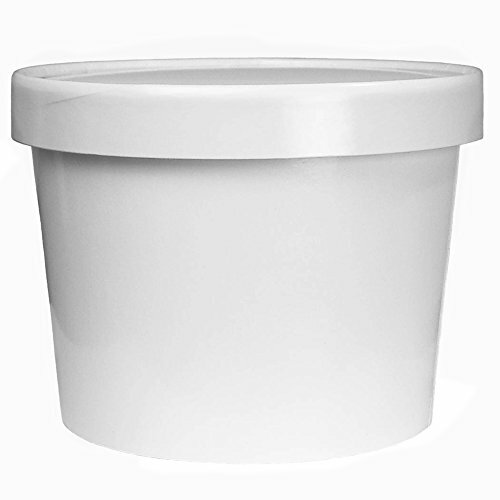 These White Paper To Go Containers with Lids are best used for ice cream, gelato, frozen yogurt and many other things. Comes with container and lid. ✔✔ AMAZING QUALITY: Comes In A Package Of 100 Lids And 100 Cups. These Ice Cream Cartons are Made From High Quality FDA Approved Paper Material and Are What The Big Ice Cream Companies Use to Store Their Delicious Ice Cream To Help Prevent Freezer Burn. Lucky For You, You Don't Have to Leave The Comfort Of Your Home To Get These! ✔✔ SO MANY USES: Perfect For Freezer Storing Frozen Desserts, Ice Cream, Frozen Yogurt, Cereal, Hot Soups, Yogurt, Cake, Pie, or Any Food You Desire. These Containers are Used by Thousands of Happy Customers and in Grocery Stores Across the US. ✔✔ PERFECT FOR YOUR PARTY: These Gorgeous Paper Cups Are Exactly What You to Store Food For Your Next Birthday Party, Wedding, Holiday Celebration, Church Activity, Family Get Together, Or any Other Event. ✔✔ EXTREMELY DURABLE: These Paper Food Storage Containers are Very Thick and Sturdy to Enable You to Store Food in the Freezer for Long Periods of Time Without Risk of Freeze Burn. ✔✔ WE HAVE THE SIZE FOR YOU: These Amazing Cups are 64 oz Which is the Perfect Size for the Leftovers of Your Favorite Ice Cream or Homemade Treat. The Top Rim is 6.636 Inches In Diameter, Bottom is 5.440 Inches In Diameter and the Cup is 4.82 Inches Tall. If you have any questions about this product by Frozen Dessert Supplies, contact us by completing and submitting the form below. If you are looking for a specif part number, please include it with your message.